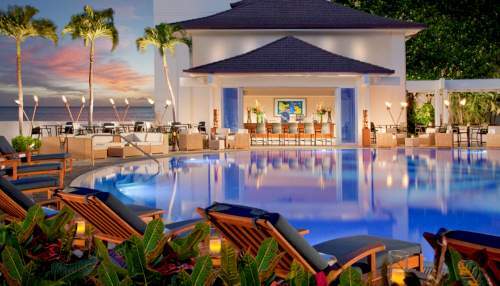 There are some excellent Oahu luxury resorts. These resorts get great reviews by past guests, are 5 star and of course, luxurious. Below are the fantastic resorts that have met our standards - and those who've been there before. Oahu is to the locals from generations past, been called the gathering place. Since long before we came along people have gravitated towards the wonderful, beaches, mountains and hospitality of this enchanted island. A special place - now with outstanding luxury resorts. See also the Top 25 Oahu Resort Deals and the best Oahu vacation rentals. This is the luxury resort that has traditionally set the standard in Hawaii for decades. While the price tag these days implies it is a great place for royalty to stay, back in the day it was indeed the grounds for Hawaiian royalty. Today, you can take a walking tour and experience a retelling of this glamorous past. Despite the price tag, we find today the resort does continue to offer value and quality at the luxury end of the market. Location: 5 acres, end of Waikiki Beach. Honolulu, Oahu, Hawaii. Walking distance to shopping, restaurants and entertainment. 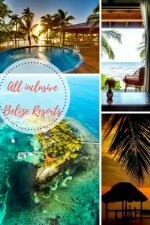 Resort highlights: leading hotel in the world, numerous awards, private registration, heated oceanside pool, spa with South Pacific treatments, complimentary wireless Internet, fitness center, tickets to 3 museums, business center, afternoon tea on the veranda, French and contemporary cuisine, water sports nearby, golf nearby. Perfect for: swimming, spa, shopping, great location. Accommodations: 455 rooms, furnished lanais, 300-count cotton linens, elegant decor. What reviewers say: Friendly and professional service, best shopping is right on the doorstep, an oasis away from busyness, showing it's age and needs updating, great value for Hawaii, wonderful room. There were a number of negative reviews concerning customer service, renovations, and it not living up to it's 5 star standard a few years back now but this aspect seems to have improved a lot in recently. Also the recent renovations have come off a treat to prepare this prestigious hotel will continue delivering a quality into the future. More information, reviews and special offers on Halekulani. Find more 5 Star Hawaii in Resorts. Ihilani is set on a peaceful beach - actually four secluded beach coves on the warmer side of the island - and is a fairly easy choice for one of the best resorts in Oahu. A spectacular location in roomier and authentic Ihlani which is about a forty minute drive from the airport and the major tourist spots. The luxury aspect of this quality resort is well established is a sizable complex that really does have as many facilities and amenities as any comparable resort in Hawaii. A truly outstanding spa and marina, tennis with views to a championship golf course. Read more on the family friendly qualities of this resort or see the latest reviews and information on Ihilani Resort and Spa here. While not one of the classic Oahu luxury resorts, the Aulani Disney Oahu Luxury Family Resort has been done with the taste you would expect of a 4.5 star resort. It's a step up from what is offered on the mainland. Location: Beach front, Honolulu, Hawaii. Perfect for: Spa, beach, swimming with dolphins, great service. Accommodations: 312 rooms, 31 suites, spacious, mixture of plantation and Asian influenced decor. 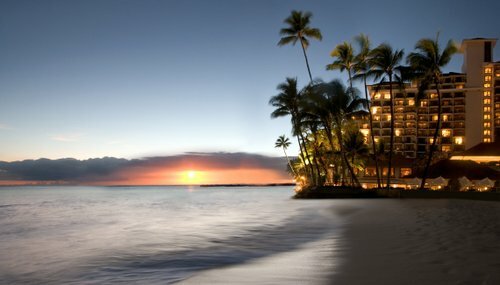 Resort highlights: Spa, meet the dolphins, pool, secluded beach, CHI Health and Energy fitness center, sports and water sports, Keiki club for kids, Hawaiian cultural classes, 5 restaurants and cafes, business center, room for functions and meetings, strive for subtle and discreet service, lessons (surfing, etc). 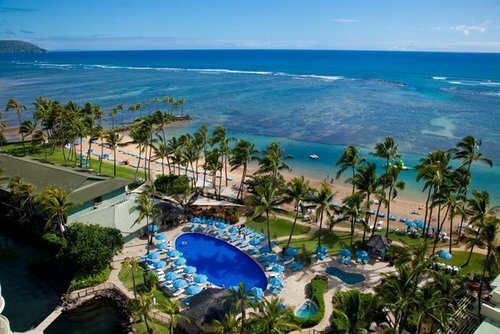 What reviewers say: beautiful and romantic, great place for a honeymoon, excellent service (many staff have been there for a long time), renovation looks great, "no luxury hotel had better service than the Kahala", food could be better. One of the great Oahu luxury resorts. 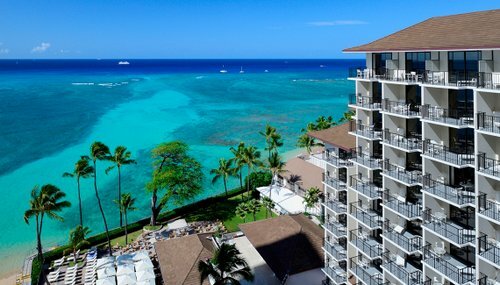 More information on the The Kahala Oahu Luxury Resort. Accommodations: 1230 rooms, Hawaiian decor, spacious, private balconies, mountain, city or ocean views. 40 story building. Resort highlights: Na Ho'ola Spa, beach, pool, hot tubs, Camp Hyatt, "Dive-in Movies", gym, function space, nightly entertainment, fine dining, Asian and Italian cuisine, 24-hour business center, water sports nearby, surfing school nearby, many attractions nearby. 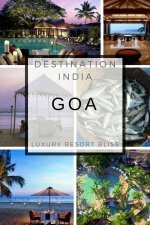 What reviewers say: fabulous location, unpretentious and elegant hotel, you can buy everything you can think of nearby, clean, huge room - ocean front view is amazing, the double beds are too small, perfect place for a honeymoon. 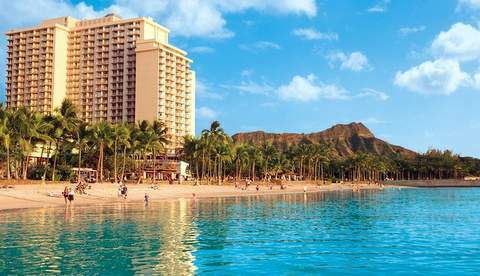 More information, reviews and special offers on the Hyatt Regency Waikiki Beach Resort And Spa. 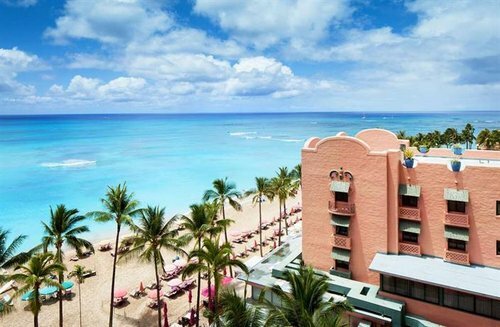 The Sheraton Waikiki offers good access to Waikiki if you are looking for a larger well established resort with lots of amenities. Looking for a condo style apartment on Waikiki? Click to learn why the Aston is one of you best choices. Special Note: If you want to go swimming at the beach, note that not all beaches are swim-able. We have noted the ones that are not. Also, note that all rooms are non-smoking in Hawaii. 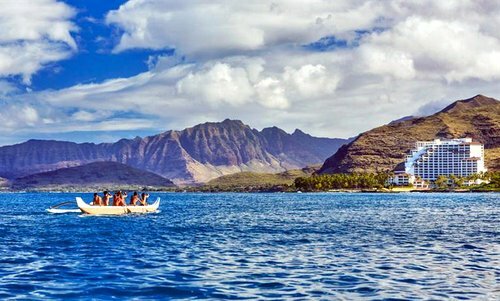 Like to know more about Oahu and some fantastic family vacation options? Check out our Oahu Family vacations review with our picks for the best family resorts and options on this outstanding Hawaiian Island. For more in Hawaii, take a look at the right hand menu. Having been around since 1927 this historic Honolulu, the five star The Royal Hawaiian has had a bit of practice getting things right. And that they do with a gorgeous private beach and heaps of facilities around the large 500+ room resort. This is a Hawaii vacation resort and you don't need to think twice about bringing your kids here with a kids club,slides and a lot's of play areas. Similarly for parents there are plenty of facilities and you are als right on the main beach at Waikiki. The name says it all and it is very popular for it's beauty and surf culture. Famous for those huge barrels on the surf movies but becomes calm, safe beach in the summer. Another famous for big surf waves but turns into a snorkeling haven in summer. With protection offered by the cliffs that rise out of the water this beach is safe for children. For sunshine in the morning and afternoon shade provided by the nearby mountains.